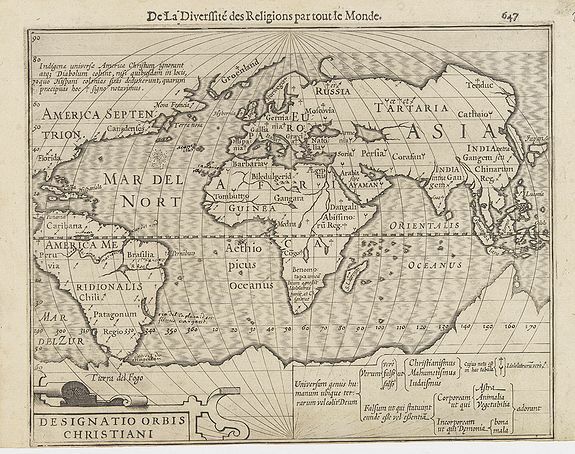 Old map by MERCATOR - Designatio Orbis Christiani. Publisher: MERCATOR, G. / HONDIUS, J. Size: 5.8 x 7.4 inches. Condition: Some age toning of the paper. No lower margin as issued. Else good condition. A world map showing the different religions in the different parts of the World. Originating from pocket atlas by Mercator-Hondius "Atlas Minor" and one of the first thematic maps. It is on a hemispherical projection and uses symbols (identified in the key at bottom) to designate those areas of the world that are Christian, Moslem, and pagan.